"We slipped a note…under the door into the Pentagon and said, ‘Look, let us go up there…and burn down five of the biggest towns in North Korea — and they’re not very big — and that ought to stop it.’ Well, the answer to that was four or five screams — ‘You’ll kill a lot of noncombatants!’ — and ‘It’s too horrible!’ Yet over a period of three years or so…we burned down every town in North Korea and South Korea, too….Now, over a period of three years this is palatable, but to kill a few people to stop this from happening — a lot of people can’t stomach it." "Chiang Kai-Shek and Rhee…feared that peace would be the end of them. Dulles feared that peace would fatally interfere with the plan to rebuild the old Axis powers for a new anti-Soviet crusade…the dominant trend in American political, economic and military thinking was fear of peace. General Van Fleet summed it all up in speaking to a visiting Filipino delegation in January, 1952: ‘Korea has been a blessing. There had to be a Korea either here or someplace in the world.’ In this simple-minded confession lies the key to the hidden history of the Korean War." At the conclusion of World War II, the Soviet Union and the United States occupied previously undivided Korea in order to expel the defeated Japanese who had ruled the entire Peninsula for decades. A temporary demarcation line separating the Russian and U.S. forces was created approximately along the 38th parallel. This line was not intended to create two separate countries. But as the Cold War deepened, both powers insisted that re-unification of North and South be carried out according to their own ideological bias. The U.S. supported an extremely repressive ruler in the South, Syngman Rhee, while the North was led by Kim Il Sung, a fiercely independent man greatly vilified by the West. The two sides increasingly clashed across the parallel for several years. The North Korean government claimed that in 1949 alone, the South Korean army and/or police committed over 2600 armed incursions into the North. Subsequently, documents have suggested that, at a minimum, there were a number of attacks by South Korean forces into the North, and that many, if not all, of the attacks on the South had been reprisals. Syngman Rhee’s public pronouncements throughout 1949 and early 1950 consistently spoke of his desire to order his forces to attack the North. Whatever happened on June 25, 1950 remains unclear, but the fighting on that day is considered by some scholars to have been no more than the escalation of an ongoing civil war provoked by the Cold War. Long before the Korean War broke out in June 1950, there was another civil guerrilla war being waged within parts of the South between Koreans aligning themselves with their American occupiers, and those desiring clear independence from outsiders. Repression by Rhee’s security forces against perceived dissenters with the protection of the U.S. presence was systematically brutal. The success of the revolution in next door China in 1949 greatly increased U.S. anxieties and contributed to firm support of the tyrannical, but anti-Communist Rhee. . The United Nations was not a neutral organization in 1950 any more than it is in 2000. The Security Council’s June 27 resolution to defend South Korea was reached with little accurate information and it was clear there was no interest in acquiring such information. The United States exerted great pressure on the other members. The Soviet Union was absent due to its boycott of the UN over refusal to seat Communist China in place of Taiwan. Yugoslavia’s request that North Korea be invited to present its perspective was dismissed out of hand. Token military forces from sixteen other countries took part in one way or another which technically enabled the war to be fought by "United Nations" forces. But it was to be an "American" show, a fact finalized on July 7 with a UN Reolution that, in effect, made the United Nations’ forces subject to U.S. General Douglas MacArthur without making MacArthur subject to the UN. The brutal war that developed was fought in defense of the Syngman Rhee regime, not for the benefit of an undivided Peninsula benefitting all Koreans. It continued ruthlessly until an armistice ending the hot war was signed on July 27, 1953. To this date there has been no peace treaty signed, even though talks technically continue at Panmunjom on the northern side of the Demilitarized Zone (DMZ). Officially the U.S. is still at war with North Korea. Everything we learned about Vietnam had its forerunner in Korea: U.S. support of a corrupt, tyrannical ruler; regular atrocities; mass slaughter of civilians; torture and imprisonment of dissidents not assassinated; cities and many agricultural areas bombed to total destruction; intense and calculated management of the news about the war; and consistent sabotaging of peace talks throughout the war’s duration. 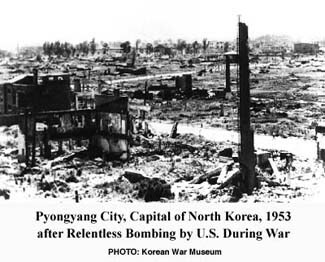 Earlier suppressed reports of atrocities committed by U.S. ground and air forces were re-affirmed in 1999 by eyewitness accounts of Korean survivors and American military veterans who had been ordered to kill large numbers of civilians, as well as declassified U.S. Air Force documents. 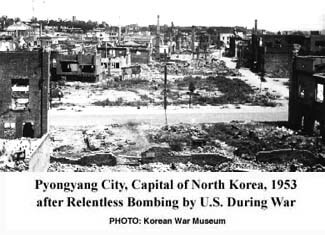 In one case some 2,000 Korean civilians were forced into an open mountain area near Yongdong and slaughtered from the air. 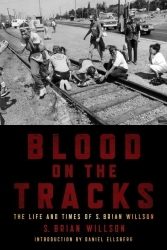 In other cases hundreds of civilian refugees were blown up as they fled across detonated bridges or machine-gunned as they sought protection under viaducts. The death and destruction inflicted, especially in the northern part of the Peninsula, defies imagination. It is now believed that more than four million people died in the war, perhaps as many as three million of whom were from the North of a population, at the time, of about nine million. All major cities, about five dozen, were totally destroyed in the North by U.S. airpower. At the beginning of the war, U.S. General Curtis LeMay asked the Pentagon "to turn SAC [Strategic Air Command] loose with incendiaries" on North Korea. Though Truman rejected such a blitzkrieg, SAC was ultimately authorized to bomb urban and rural areas anyway, "piecemeal." Most villages were destroyed as well, especially if they were "suspected of aiding the enemy." Most dams and dikes were destroyed, wiping out most rice crops. Saturation bombing and scorched earth policies were commonly used throughout the war. U.S. extensively used napalm in Korea long before it became a household word in Vietnam. There is growing evidence to support North Korea’s accusations that substantial germ and biological warfare was utilized during 1952 bombings as some U.S. pilots had originally confessed while in captivity. Over a period of about three years, LeMay remarked: "We killed off – what – twenty percent of the population of North Korea." The truth is that the figure may be a staggering one third of its population. In summary, the war wreaked destruction hardly equaled in the worst battles of World War II in Europe. It has left bitter memories. After the Armisitice was signed in July 1953, a Military Demarcation Line was created continuing to use the 38th Parallel as a general guide. A DMZ exists two kilometers on each side of the Line. The families of some 10,000,000 Koreans have been permanently divided since. In the 1970s the United States constructed a wall across the 150 mile long DMZ, 16.5 feet tall and up to 30 feet wide at its base, bolstered by razor wire and regular gun towers. There has been virtually no mention of this wall in the western press even though it made the Berlin Wall look small in comparison. Nonetheless, reunification has remained a passion among virtually all Korean people. In the past, the South Korean government, supported by the U.S., has vigorously opposed reunification efforts, though that stance has been softening since the first democratically elected government in the South recently came into power. There remain about 37,000 U.S. troops in the South. Until recently the U.S. had an estimated 1,000 nuclear weapons pointed toward the North, even though the latter had no nuclear capability whatsoever. Historically, there have been no religious, ethnic nor other minorities on the Korean Peninsula. Out of its 5,000 year history, the Peninsula has been divided for only the years since 1945. Washington bears the brunt of responsibility for bringing the Korean War to a close, to replace the 1953 ceasefire with a permanent peace agreement, and to extricate itself, once and for all, from the Korean Peninsula. Then, and only then, can there be hope that the Koreans can once again be rightfully united. Important Quotes Revealing Aggressive Intentions of the South Against the North in 1949-50 Prior to the June 25, 1950 Fighting Which Became the Established Date for the Beginning of the "Korean War"
"Attention should be invited to the fact that there is a standing order which states no unit will cross the 38th parallel. I know of only one instance where Army ordered an attack on terrain North of the 38th, this was on Onjin and was for tactical reasons. With very few exceptions, all of our parallel troubles originated in commands subordinate to Army. My counterpart and I are firmly convinced that all attacks on South Korea have been reprisals, and almost all incidents have been agitated by SKSF [South Korean Security Forces]." "One usually hears that the Army never attacks North Korea and is always getting attacked. This is not true. Mostly our Army is doing the attacking first and we attack harder. Our troops feel stronger." "I feel strongly that now is the most psychological moment when we should take an aggressive measure…We will drive some of Kim Il Sung’s men to the mountain region and…gradually starve them out…We will be in a 100% better position." "On the question of attacking northward, I can see the reasons for it, I think, and sympathize with the feeling that offense is the best and sometimes the only defense. However, it is very evident to us here that any such attack now, or even to talk of such an attack, is to lose American official and public support…The strong feeling…is that we should continue…to avoid any semblance of aggression, and make sure the blame for what happens is upon Russia." "It was with great care and interest that I read your letter to Dr. Oliver with regard to…the disposal of the puppet regime in the North. The proposals you expounded therein are…the only logical and ultimate method for bringing about our desired unification. However…the time is not opportune as yet…I am sure he [Oliver] cannot publicize such a proposal as our fixed government policy. Nor do I think that it would be wise for him to make public such matters of secret import. I have discussed it with Ambassador Chang and Dr. Oliver and we unanimously agree that this matter should be regarded as the basic plan of our Government that should be carried out when we are ready and the time is opportune." "RHEE PREDICTS FORCE TO END KOREAN RIFT," Seoul, Oct. 31 (Associated Press). "Korea’s President Syngman Rhee prophesied today force may be necessary to settle the rift between North and South Korea. Standing on the decks of the United States cruiser St. Paul in Inchon harbor, Mr. Rhee told American Navy officers and sailors: ‘When we have to settle this thing by war, we will do all the fighting. We are not asking our friends to do our fighting for us…We can’t live much longer this way.’"
"KOREAN ARMY SET FOR WAR," Tokyo, Oct. 31 (United Press). "Sihn Sung Mo, South Korean defense minister, here to see General Douglas MacArthur, said today that his army was ready and waiting to invade Communist-controlled North Korea, but that it had been restrained by American officials. At the same time President Syngman Rhee said in Korea that his government would not much longer tolerate a divided Korea ‘and if we have to settle this thing by war, we will do all the fighting needed.’"
"…I give you some encouraging news which I have received confidentially from a top level, reliable source in the Pentagon. I am informed that the State Department and the Pentagon are planning a firm stand with respect to the U.S. Oriental policy. In this anti-Communist plan, Korea will occupy an important position…President Truman will sign, very soon, authorization which will grant permission for armament for Korean ships and planes." "I…transmit herewith copies of the mimeographed listing of military equipment and supplies transferred by the United States Military Group to the Korean Security Forces during February 1950." "There is constant fighting between the South Korean Army and bands that infiltrate the country from the North. There are very real battles, involving perhaps one or two thousand men. When you go to this boundary, as I did…you see troop movements, fortifications, and prisoners of war." "I…forward herewith two copies of the listing of…military equipment and supplies transferred by KMAG [Korea Military Advisory Group] to the security forces during April 1950." This entry was written by brian, posted on at 4:41 pm, filed under The Most Dangerous of Rogue Nations: The United States, Korea. Bookmark the permalink. Follow any comments here with the RSS feed for this post. Post a comment or leave a trackback: Trackback URL.